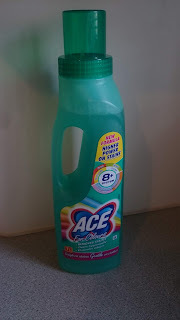 I gave 4 Ace products a go! When I think of Ace, I mostly think of stain removing, but there’s a lot more to Ace than that. In fact Yvonne thought I was crazy when I poured some out and started cleaning with it. 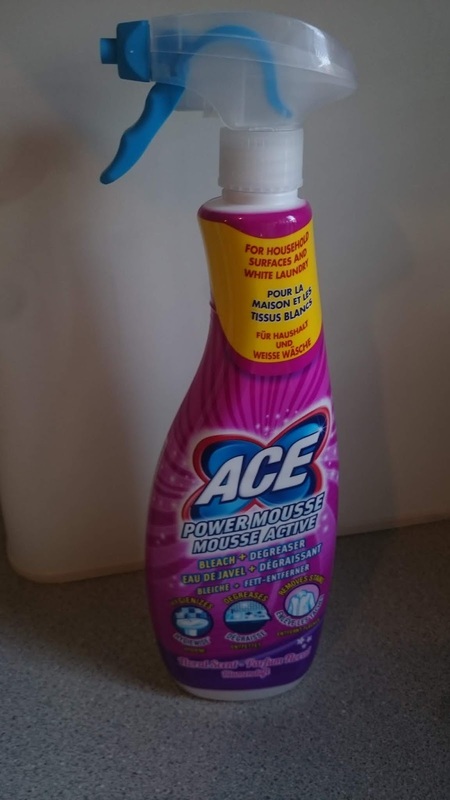 Ace Power Mousse comes in a handy spray bottle. It has a sealable nozzle to prevent accidental squirts. To clean in the kitchen or bathroom - just spray. It foams as it lands, which seems to help it stay on vertical surfaces. Then just wipe with a damp cloth or sponge. You can also spray it onto white clothes to remove stains, wait 5 minutes and wash as normal. It does have a bleachy smell, but not overpowering. I liked using this in the bathroom, it left everything clean and shiny. 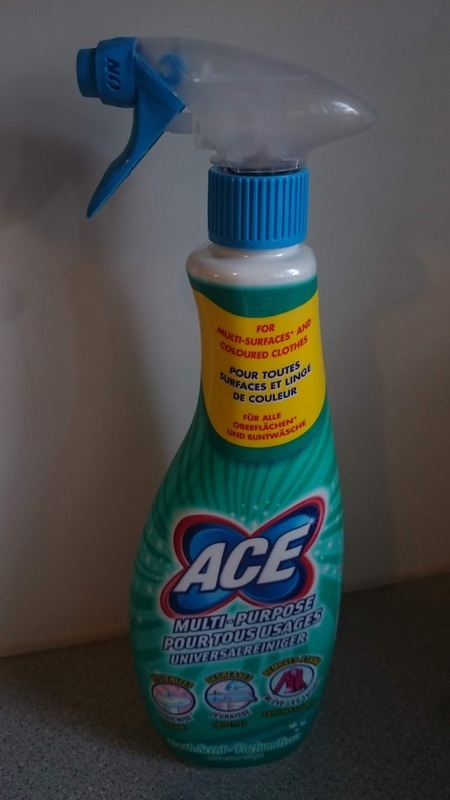 Ace Multi Purpose is also in a spray bottle. And just like the Power Mousse - just spray and wipe with a damp cloth/sponge. This one can be sprayed onto coloured clothes before a normal wash to help on stains. There are a number of surfaces it says not to use it for, copper, brass etc. But this wasn’t an issue for me. Unlike the Power Mousse it smells a bit more like laundry detergent when you spray it. I liked using this one in the kitchen and it removed some stubborn built up greasy patches down the side of the cooker. Ace For Colours comes in a laundry detergent style bottle. It has a non-drip ‘dosing’ cap. You can use it to remove stains in colours, whites and delicates; in your washing machine, to pre-treat stubborn stains or for handwashing. You can also add it to water or pour straight onto surfaces to clean with. It sort of froths on the cloth as you wipe. It did clean well, but it felt rather strange cleaning with what felt like something for washing clothes. 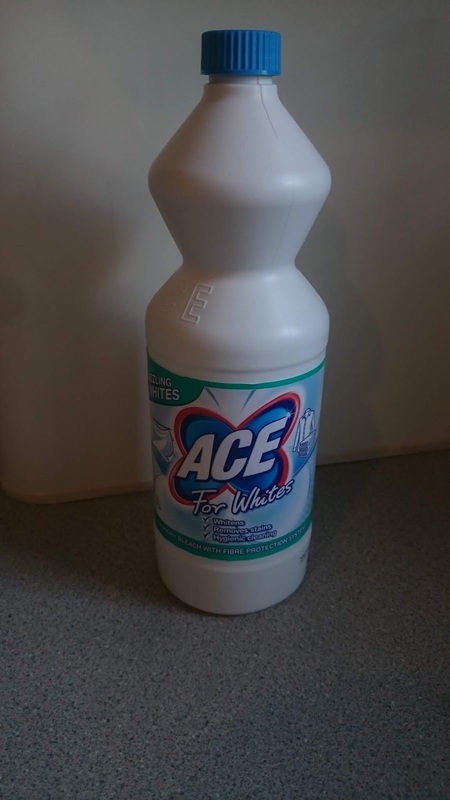 Ace For Whites is for removing stains on white clothes. You can use it in the washing machine or to hand wash clothes with. You can dilute or undiluted for cleaning surfaces, floors etc. I've mostly used this to whiten and treat stains on our son's white school shirts. It does have a quite strong smell of bleach.